When the air filter is not installed, your air conditioner cooling coil will get clogged. This picture shows a blocked AC cooling coil. This HVAC unit was on for a long time and never reached the desired temperature. After cleaning the air conditioner cooling coil the AC unit worked as its peak performance. When your cooling system has dirty A/C coils, you’re paying more to cool your home and getting less cooling than you’re paying for. An air conditioner doesn’t add coolness to the inside of your house; it removes heat. What’s left behind when you take out the heat energy is a cool, comfortable home. The components that make heat transfer happen are the evaporator and condenser coils. Since these coils are continuously exposed to both indoor and outdoor fan-driven airflow, they easily accumulate layers of dirt and dust that degrade optimal heat transfer. In addition, passages inside the indoor evaporator coil are constantly damp with condensation. Airborne mold spores can find a perfect breeding ground in those wet coil passages. 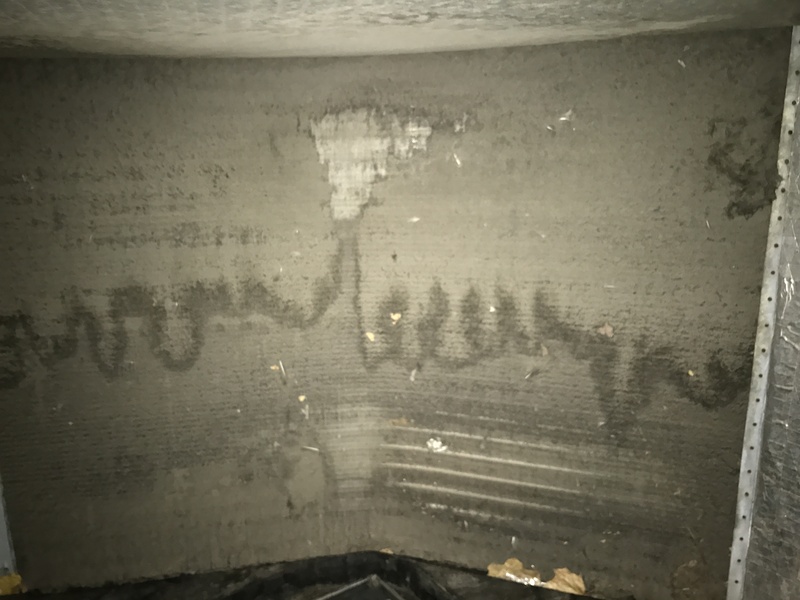 Mold growth inside an evaporator coil can eventually obstruct airflow through the coil. While the outdoor condenser coil can be washed down with a garden hose to remove external dust accumulation, do-it-yourself methods seldom reach the interior coil passages where dust and dirt inhibit heat transfer. The indoor evaporator coil is even more problematic. Installed inside the air handler, the coil is often a sealed component that’s not user accessible. The expertise of an HVAC technician is required to access the evaporator coil for inspection and cleaning. Low pressure air blown through the coil and use of a soft brush can remove minor accumulations. More stubborn deposits require application of special solvents designed for coil cleaning. Small low-pressure steam cleaners are also utilized in some cases. Pump sprayers can be used to infuse foaming coil cleaner into the interior of the coil. The coil is then flushed clean with fresh water. Pressure washers combined with a pre-application of coil cleaning solvents are increasingly the choice of professionals. These are followed by pressure rinsing with clean water.